I had several destinations in mind. Some secluded corner of Norway certainly sounded like a nice idea. Or some Finnish island. Archipelago Sea? Or some islands in the Gulf of Bothnia? Or maybe not even an island but just a random cabin in the middle of Finnish nowhere? So many options. In the end, the matter was decided when I found some inexpensive accomodation I liked. It was one of the Lost in Lapland cabins (direct link to their website), in a village named Äkäslompolo, in Finnish Lapland, next to Pallas-Yllästunturi National Park. They offered a nice-looking cabin, named Kelostar, at a particularly reasonable price. I booked it (note: payment is possible only with a direct bank transfer — took me some time to figure out how to make a transfer from Russia to Finland), and started reading up about Lapland. Lapland is most often thought of as the northernmost part of Finland. In fact it also includes the entire north of Scandinavia and also of Kola Peninsula in Russia. Lapland, in this meaning, is best defined as the region traditionally inhabinted by Sami people, also known as Lapps. There are about 100,000 of Sami in Finland, Sweden, Norway, and Russia. They have a flag, a funky national dress, a tradition of reindeer herding, and an utterly incomprehensible language (looks a bit like a horribly mangled Finnish), but they never had their own statehood. Sami are now a minority in Lapland, which is mostly inhabited by regular Finns, Swedes, Norwegians and Russians (also Tornedalians, who are a sort of Swedish Finns, and Kvens, who are a sort of Norwegian Finns). Finnish Lapland, Lappi in Finnish, is indeed the northernmost part of Finland, and the largest region of the country by far, some 40% of the entire territory or so. Finnish Lapland is very sparsely populated; its entire population is only 180,000. The only major (more or less) city is Rovaniemi. Lapland towns and villages are clean and neat but pretty boring and uniform. This part of the country was pretty much entirely destroyed in the little-known Lapland War. The war took place in 1944-1945, when Finland reallied with Soviet Union, and started to expel German forces, which mostly happened to be located in Lapland. There were very few actual casualties, but retreating Germans caused massive damage, burning down all towns and destroying all roads. Thus modern Finnish Lapland has been rebuilt for scratch, and, apart from the residence of Santa Claus in Rovaniemi, is worth visiting mostly for its nature. 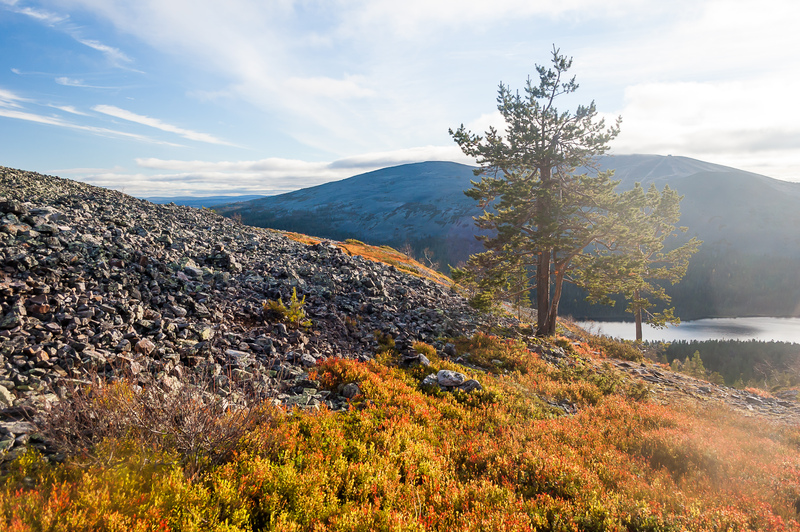 There are many huge national parks in Lapland, with thousands of kilometers of hiking trails. There are numerous skiing resorts. There are reindeer and husky rides. Lapland, which, honestly, is pretty much just lots of spruce trees and low mountains and some lakes and a really cold climate — that describes, like, a half of Russia! — manages to sell itself amazingly well. Lapland is usually visited in winter, and its skiing resorts (Äkäslompolo is one of them) get very busy and crowded. Myself, I don’t like cold, but I love (fairly casual) hiking, and early autumn is the best season for that (mosquitoes and gnats get very nasty in summer, or so I hear). So I thought this was an excellent chance for me to see some Northern nature. Of course I was going to go by car. The distance from St. Petersburg to Äkäslompolo was 1120 km; possible if exhausting to cover in a single day. The car also allowed me to use Äkäslompolo as a base, and see some other places, including the point where Finland, Sweden, and Norway meet, and a bit of the northern fjords of Norway. In short, my decision to go to Lapland turned out to be absolutely right. This was the best vacation in my life by far, and I want to repeat it every year, preferably at least twice. It was even better than Western Norwegian fjords; the North is the prettiest and the most peaceful place in the world. And I enjoyed being alone for nine days. It’s not like I didn’t see a single person; I just interacted very little with anyone. The loner I am, I loved it. A 1120 km drive from St. Petersburg, Russia, to Äkaslompolo, Lapland, Finland. Äkaslompolo, a Finnish Lapland ski resort, in September, and a cabin I rented there. Nature trails around the great Ylläs Fell in Äkäslompolo, Finnish Lapland. Also reindeer! This is where the really good pictures start: Kesänki Fell in Finnish Lapland. A small and a huge Sami seida holy stones in the vicinity of Äkäslompolo, Lapland, Finland. Driving on for 250 more kilometers to the north, on the prettiest and northernmost road of Finland. A walk through some ridiculously beautiful scenery to the point where Finland, Sweden, and Norway meet. A tiny piece of Northern Norway. Road trip along the Lyngenfjord up to Skjervøya Island, lying on the 70th parallel North. All the way back from the 70th parallel North through Norway, Finnish Lapland, and then through the rest of Finland.